There’s no mobile phone reception outside the building where I’m meeting Chris Humphrey, at least on my network. This is frustrating on Great Portland Street, but maybe it shouldn’t be: London is full of reception deadzones, courtesy of all that steel and concrete in an ever-changing cityscape. This is the sort of situation that creates business for Anite, the wireless testing specialist, as people are increasingly intolerant of interference when it comes to their favourite gadget. Posted on 12/05/2014 by Jess. 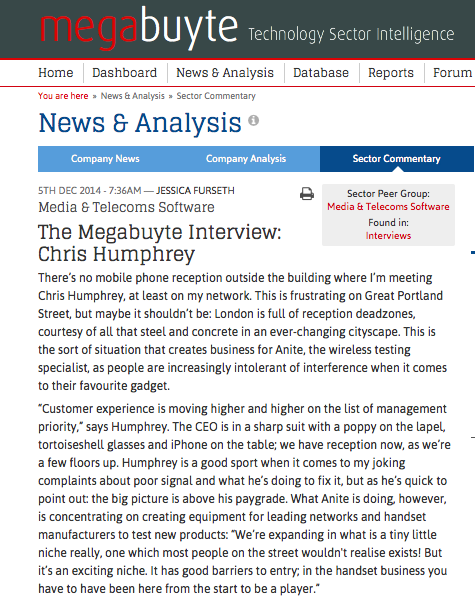 This entry was posted in Technology features and tagged anite, chris humphrey, technology, telecoms, wireless. Bookmark the permalink.